Bringing out-of-the-box thinking to the hotel’s outlets is Gorgeous Group, the UK-based consultancy which specialized in creating restaurants and bar concepts with its motto “Experience is everything”, founded by Robbie Bargh, the creator of many award-wining bars and restaurants throughout Europe. In Bangkok, the renowned consultants have drawn inspiration from the vibrancy of the city and its unique urban capacity to surprise. The result has been concepts that are fun and authentic, catering to experience seekers who search for more than just dining and drinking, and look for the ambience and the style that conjure a true spirit of joie de vivre. 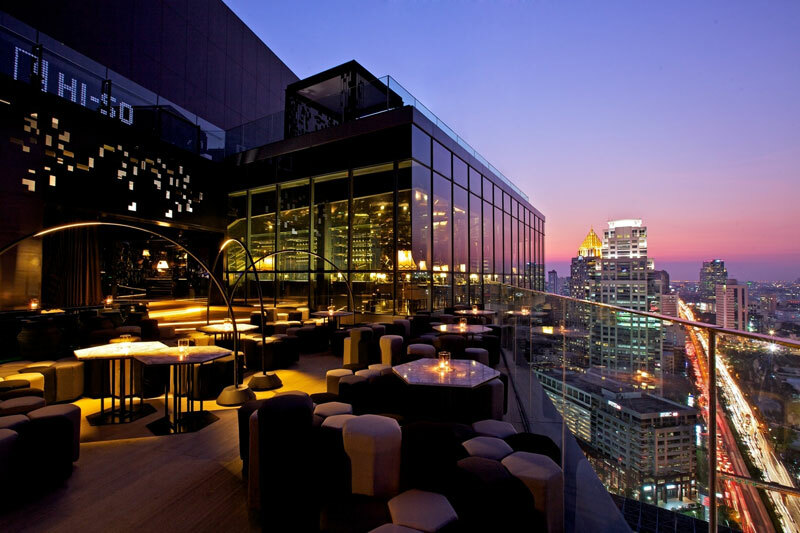 The fruits of Gorgeous Group’s consultancy, combined with the flare of Sofitel So Bangkok’s culinary artist team, distinguish what is an exciting selection of innovative bars and restaurants. On the 29th floor, Park Society is where fine gastronomy meets spectacular views that captivate the senses as the array of surrounding city lights playfully converge on the chic setting. Giving a choice of indoor and alfresco dining and with a culinary artist team led by awarding-winning Chef Paul Smart, Park Society adopts a Chef’s table concept which allows diners to tailor their dishes exactly the way they like from a wide range of fresh seasonal ingredients. As part of Park Society, the rooftop HI-SO, offers private and intimate cabanas where dishes from the Park Society menu are served in an exclusive and romantic atmosphere, while personalised butler service makes it an even more privileged experience. Featuring its signature Molteni stove, Red Oven, on the hotel’s 7th floor, is styled as a World Food Market and offers dishes reminiscent of traditional street food fare but given a contemporary twist by Executive Chef Nicolas A. Vienne, who commands distinct live cooking stations ranging from a Japanese sushi and Robatayaki bar to a fresh seafood counter, organic salad corner and a desserts table. Playful and fun, it’s party time day and night at The Water Club: Pool and Party on the Park where a poolside bar provides a casual day setting for light refreshments and snacks and a seductive nighttime ambience for parties under the stars. Alternatively, the nearby Solarium, Oasis lawn, is the place to enjoy sunset picnics with refreshing beverage complemented by a range of savoury snacks. Finally, MIXO: Liquids and Stories, with 9th-floor views over Lumpini Park, makes the perfect haven for socialising, experimenting and engaging. Living up to its name, this stylish social lounge is unique for its creative cocktails carefully selected by its own in-house mixologist. For sheer sweet indulgence there is nowhere quite like Chocolab: Experimental Melting. This charming boutique in the lower lobby boasts the finest chocolate creations in town to enjoy in a cosy atmosphere or gift wrapped to take away. At the same time, you have a full view of the crafting of sweet treats in the chocolate laboratory, plus there’s the opportunity to attend chocolate cooking classes.